The sun is still shining and the pizza’s always hot! If you are planning a pizza party this summer, make it even more special by choosing the perfect venue, right here in the neighborhood. As you know, you don’t have to go far to have a good time. Here’s a list of some of the best places to throw a pizza party in the Broadneck area. The Cape St. Claire Swimming Pool is a great location to host birthday parties and celebrations of all kinds. You and your guests can relax on the chaise lounges or take a dip in the pool! It’s also perfect for people of all ages to enjoy, from your coworkers to your kids’ friends. And, in between swimming, a hot slice of pizza is sure to hit the spot. When it comes to a pizza party, you can’t go wrong with Sandy Point State Park. Set up camp at one of the grassy picnic areas or rent one of the shelters. There are also bathrooms and playgrounds available nearby as well. And, you can also take advantage of the grills to serve up some S’mores! Not to mention, if you want to add some adventure to the party, there are plenty of fun things for your guests to do. Take advantage of the nearby water and go fishing, boating, swimming, hiking and more. One of the best places to throw a party in Broadneck is, of course, Broadneck Park! Located on College Parkway in Annapolis, the park offers a picnic area, baseball and multipurpose fields, and a playground. You can even rent out the Pavilion to ensure you have a shady spot to mingle with friends and enjoy a bite to eat. Consider hosting your pizza party right at home. That way, you can pick any time or date to throw it. Plus, you can choose the activities, the decorations, and much more. And, if the weather’s nice, you can take the party outdoors while you dish out the pizza. But, what better place to host a pizza party than at an authentic Italian restaurant? 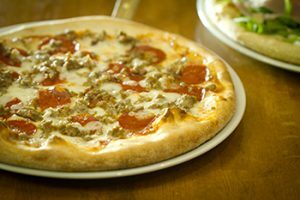 At Spizzico Italian Restaurant in Arnold, MD, we serve handcrafted pizza made from the freshest ingredients. Our menu features everyone’s favorite toppings, along with delicious appetizers, pasta, salads and more. We also have gluten-free options and a kids’ menu too. Spizzico’s casual, family-oriented vibe makes it easy to unwind and have fun. Plus, it’s one location that you can count on any time of the year, for all ages and almost any occasion. And the best part of all, there’s no cleanup required. To learn more about hosting a party at Spizzico’s, send us a message or call 443-214-5121. Also, be sure to ask about our catering services! So, whether you decide to host your pizza party at home, at a park or Spizzico’s, you can order as many delicious handcrafted pizzas as you need! Just give us a call and we’ll help you throw an epic pizza party.